The kit includes the Globalmediapro Li95U battery and SC1 1-channel D-Tap charger. Provides long lasting USB power for smartphones, tablets, iPhones, iPads, small cameras plus D-Tap power for professional video equipment. 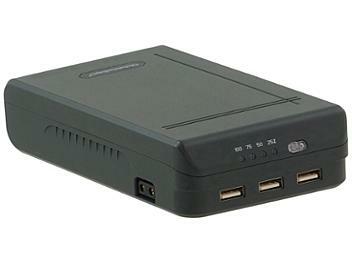 The SC1 can also charge Globalmediapro's V-Mount, Gold Mount, NP1B Mount and BC-U type batteries. Purchased to power Zoom F8 and RodeLink receivers. Perfect solution for a full day's shooting on a single charge. The bundled charger is a big bulky but works like a charm.